Nadine Wolf at a protest in Manhattan at the office of Senator Kirsten Gillibrand. 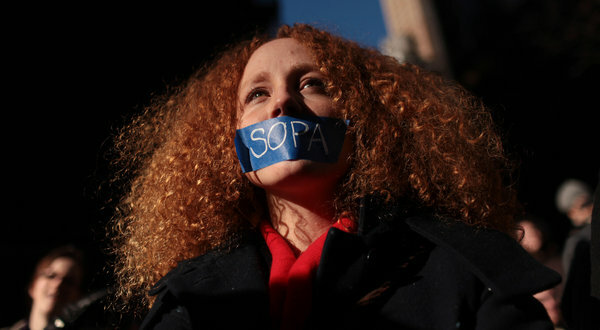 The Web buzzed with protests large and small on Wednesday as the tech industry rallied against Congressional legislation to curb Internet piracy. Some sites blacked out — among them, the English-language Wikipedia, though it was possible to access the encyclopedia through several clever workarounds — while others, including Google and Craigslist, draped their pages with information about the bills, or restricted access. Many start-ups quickly cobbled together tech solutions to support their cause. HelloFax, for example, created a tool that let people send their representatives faxes voicing their opinions through the Web. The effort was an unusual orchestration that began gathering steam online late Tuesday night and escalated early Wednesday morning, eventually whipping the Web into a frenzy. Google said 4.5 million people signed its online petition to Congress, voicing displeasure at the legislation; Twitter said more than two million posts on the subject flowed through the site by early afternoon, nearly four times as many as usual. Engine Advocacy, a service that helps people call their local members of Congress, said on Twitter that it was averaging roughly 2,000 calls per second, while Wikimedia Foundation, the nonprofit organization that oversees Wikipedia, said four million people used its blacked-out site to look up contact information for their local representative. Opponents of the legislation also took their demonstrations into the real world in New York, San Francisco and Seattle, but drew relatively modest numbers of protesters. Still, for a group that tends to be more comfortable showing solidarity from behind the warm glow of a computer screen — by changing a profile picture or reposting a favorite motto — it was a considerable showing. The New York rally, organized by a tech industry trade group, attracted about a thousand protesters in Midtown Manhattan.. Sebastian Delmont, 38, who works at StreetEasy, a real estate search site, said about half of his co-workers attended the protest. “Our worry is that they are building something like a Great Firewall, like in China and the Middle East,” he said. In Washington by Wednesday morning, several lawmakers had reconsidered their support of the bills — one in the House, one in the Senate. The legislation is intended to curtail copyright abuses by preventing American search engines and Web sites from directing users to the mostly foreign sites that allow for the distribution of stolen materials like music, movies, television shows, software and other content. The tech industry has argued that the bills are too broad, threaten free speech, stifle innovation and most likely will not even effectively eliminate piracy. That’s all for now, but a photo of the day should be coming shortly, since I’ve already picked it out. All related articles are below.